Richaroams, Richawrites, Richashoots. My versatile blogger buddy Richa does all these and more. Roaming Diaries and Richland Talk are her blogs on travel and random thoughts respectively and her lovely photographs adorn both. She is forthright on pieces that deal with society, be it traffic, vandalism of our heritage sites or the harassment by the ubiquitous auto drivers of Mumbai. I especially like her humour pieces which bring an involuntary smile to my lips. Her travel pieces are simple and down-to-earth and makes one want to go there and enjoy the sights and sounds. Richa has been one of my oldest readers who doesn’t mince her words in her comments if there is something that she disagrees about. In this guest post, she is scathing in her indictment of the Ganapati celebrations in Mumbai, which are becoming louder and crasser by the day. Read on…. Alongside the shops selling the idols, other shops selling decorations have sprung up. Painted thermocol sheets have taken several shapes and structures — grand temples, peacocks and sundry other shapes — all covered in colored glitter. Accessories like jewellery, attire, fake flowers and other embellishments for the Lord are also sold here. (Incidentally all the items are non-biodegradable) There are shops selling serial lights and lamps — all made in China. It is also the time for ‘collections’. All sorts of people from the neighborhood have been galvanised into action, soliciting contributions for the building/society/colony/park/neighboring colony Ganapati celebrations. As the day of the festival draws nearer, loudspeakers join in. Huge pandals are put up in strategic locations with thematic decorations and a stage for the Lord. Sounds all happy and festive, right? Wrong. A much loved festival marked by devotion and faith has been reduced to nothing more than a loud, commercial and ostentatious party today. As a festival, the origins of Ganesh Chaturthi can be traced back to the agrarian societies that worshipped Nature and flourished by water bodies. Every year, people brought home the rich silt deposited by rivers during the rains, to worship Nature’s regenerating powers. One presumes that gradually this clay was shaped into the idol of Lord Ganesha and thus the festival was born. At the end of the festival, what came from nature was returned to nature by immersing the idol into the water body. The potter community slowly began making sturdier idols, but the material used was still naturally degradable clay. The festival was confined to homes for ages. It became a community celebration only during the rule of the Marathas in the 17th century. Celebration of the festival as we know it was started in 1893 by the great freedom fighter Lokmanya Tilak with the Sarvajanik Ganeshotsavs. At a time when all forms of social gatherings were banned, he made the Ganapati festival a social celebration and used it as a unifying factor, rallying Indians against the British. It brought together all sections of society cutting across barriers of caste and communities. It is unfortunate that the same festival that Tilak used to rally Indians together during the freedom struggle is often a rallying point for rowdy elements today. Bigger is better — the larger the idol, the more ostentatious and the more popular it is. Height restrictions on idols are ignored with temerity. Lakhs of rupees are spent by politicians, film stars, the bigwigs of the area and even the mafia in a game of one-upmanship and vote-bank politics as each locality puts up a huge showy idol of the Lord. Some of the Ganapatis, notably Lalbaugcha Raja, attract lakhs of devotees every day including famous personalities and film stars, adding to the star value of the celebrations. Louder is also better — the whole neighborhood is kept in a state of perpetual wakefulness by the incessant blaring of loudspeakers. Even patients and students have no respite from them. And what do they play? Not bhajans and artis. The devout ‘Sukhakarta Dukhaharta’ arti is often replaced by the latest hits like ‘Shiela ki Jawani’ and other such raunchy numbers. Ganapati celebrations have also come to mean all kinds of contests and events, which, the corporate houses fall over one another to sponsor. As for the spiritual sanctity, the festival has almost lost it, and possibly makes even the Lord shudder to see the misuse of His name. With burgeoning crowds, it time for the anti-social elements to run amok. Drunken dancing and the fear of molestation of women make a visit to these pandals a hazardous proposition. Horrendous traffic jams are caused due to the erection of pandals on every corner much to the woe of the commuters. Uncontrollably large crowds and terror alerts during this time make life miserable for our overstretched police force. Coming back to the idols, they have come a long way from river silt, to clay, to pottery, to indestructible materials like plaster of Paris. The paint and decorations make them more toxic. Added to the huge size, one can imagine the havoc these idols play with Nature when immersed in water bodies. Idols today are created but do not get destroyed — it is only Nature that gets destroyed in the process of visarjan (immersion). And to think that the whole purpose of the festival was to venerate Nature and to pray to the God who removed obstacles! No wonder Ganapati is becoming one of the most dreadful festivals the way it is celebrated today. Does it sound like I don’t like Ganapati? Far from it; I love this festival – the cultural and the spiritual aspects of it, that is. I enjoy everything from installing the idol at home, decorating the shrine painstakingly, making and eating the modaks and other offerings and doing the evening Arti with the family. But my love turns into distaste and anguish when I look at the degeneration of the festival outside my home. If the ten days of celebration assaults our eardrums and throws normal traffic on the roads into disarray, the visarjan is worse with colossal traffic jams and resultant water pollution. We have made away with many undesirable traditions. Didn’t we abolish Sati for its barbarism? So why can’t we tone down the Ganapati celebrations and do a symbolic visarjan to save Nature? Mobilise support to encourage fewer Ganapati idols in your area and make the event quieter. Every building, lane, society doesn’t require a separate celebration. Believe in a wider community. Big is not beautiful and will not elevate your status. Today even though many shops are selling idols made of clay and other completely biodegradable materials like papier-mache. But it is still better to keep it small, because huge quantities of even such material can be very daunting for Nature to handle. Think about it: Can you dissolve a kilo of salt in a glass of water just because it is completely soluble? Invest in artful decoration of small idols. You will still draw eyeballs for the aesthetics. Do the visarjan at home in a bucket of water and use it for watering the plants. Or use the tanks approved by the government for the purpose. Please don’t dunk it in the closest lake or sea. A look at the Chowpati beach the day after the visarjan will reveal tales of horror. Better still, go for a bronze/brass/ceramic idol that can be used year after year. We can do a symbolic visarjan of such idols at home. The Lord will certainly bless us for sparing a thought for His Creations. Educate your friends/family/colleagues/maids and challenge outdated beliefs on the mode of community celebrations. Avoid crowded areas during peak hours even if the cops are on their highest alert. If you are an organizer at an event, instead of spending lakhs of rupees on dance competitions and the like, donate the amount for a noble cause like educating needy children or building night shelters for the homeless. And my pet peeve – Please don’t break traffic rules. The policemen are already a harried lot and so are the other people on the roads during this time. Don’t add to their woes and the chaos. Some wise person said, Be the change you wish to see in the world. So let us try to be just that. This year let us celebrate Ganapati, retaining its sanctity and harmony with Nature and do what we know is right. Couldn’t agree more. In the 7 years I’ve been away from Mumbai, I see the trend catching on in Chennai too. ‘Ostentatious’ is indeed the correct word. You spoke my mind, Richa. Beautiful, thoughtful and relevant post. It is indeed sad to see the degeneration of the festival at large. I use the same Ganesha idol every year, and do not do the immersion. The sight of lakes and ponds after the visarjan gives me goosebumps. Thankfully, the scenario in Bangalore is still better as compared to Mumbai and even Ahmedabad. The festival is celebrated on a much smaller scale here. That said, the purpose of the festival has indeed gotten lost somewhere down the line. Great points made! I loved the idea of having common Ganpati instead of pandals in every gali, koocha, mohalla! We had bought a beautiful white idol four years ago. We bring it to to the living room, decorate the surroundings and place it back every year. The feeling is still very festive and the puja is still very beautiful! Good thinking. This is the best solution to this whole festival atleast at home. It is hard to control the number of pandals that come up in our surroundings – not everyone would lend their ears to us. But atleast at home, it will be nice if people reuse their existing Ganapatis. from childhood i have observed the ganpati festival as a very homely and quite festival but we used to eagerly await this festival as for modaks and and the activities more of a talent hunt competitions organised in our residential colony .it was a true joy, cheer and genuine religious fervour & on the visarjan day the lines of “ganpati bappa mourya agle baras to jaldi” really meant a lot . but now a days the festival involves much hard work, inconvenience and transgressions, not all of which can be policed or controlled. Well said Amruta. The homely festival is hardly at home now and is now characterized by band,baaja and shor. I remember the various activities in my colony too. Those were fun. But now there are only quarrels about bigger idols and petty matters. Sometimes I almost say, ‘Agle baras jaldi mat aana’! Happy Ganesh Chaturthi. It would be great if they could tone down the noise and stick to clay idols. They are environmentally friendly and not pollute our water bodies. Thanks Liju. I totally agree. If these two things were curbed, this festival would be so much better for everyone. Things instead of changing for good, have gone even worse this year. In our complex, there used to be TWO pandals, till last year… amongst 14 buildings, this year there are THREE. Petty fights and silly politics between so called committee members meant more lights, more music and more noise… its grating and REALLY annoying. But how do you make them understand that Nurture and love is better than ego? Haha. I am sure the conversation Up there would be on those lines you mention. :). In our area it was the same thing. Petty fights are part of anything that involves power/money/attention. Festivals that are supposed to bring people together have deteriorated to dividing them! Perhaps like minded individuals like yourself should form a ‘Third Front’ and put some sense into their heads to come together and celebrate! I live in Pune, where it all started. The noise and crowd does bother me; but I can’t find enough people in my neigbourhood who could get together to make a difference. So, I have made my peace with the Ganesha’s devoted millions and pray that my blood pressure remains steady and my eardrums withstand another year’s heavy artillery of drums and revelry. And, yes, I have been using the same POP idol for the last ten years. Grinning and bearing it is an option that all of us are left with when it usually comes to dealing with the bigger community Ganapatis that we have no control over. Good luck with putting up this year and enjoy it in the confines of your home! Well said. I get irritated when people disturb and disrupt other’s lives in the name of religion, God and festivities. The complete disregard for rules, causing trouble to others is just too much. If only people had some respect for the law, rules and others right to peace, this country would be a much better place indeed! Yet another Ganesh Chaturthi has come and gone and nothing seems to have changed. In our small society of 16 flats, 12 of the flats have bought Ganpati idols home. Just suggesting that we have one Ganpati for the building was akin to blasphemy. One day after our society compound is littered with the debris of thermocol and flowers and leaves and what not. The pleasure and spirit of a festival gets totally squashed. I loved the way you have written this post and come up with easy to follow suggestions. If only the people who need to read this, actually read it and follow it ! Many households uphold the tradition of having a Ganapati every year and they may not want to break this tradition. What could work though is asking them to reuse or atleast use a small eco friendly idol. It is horrible that people decorate their homes on one hand and litter their own houses on the outside. We should have a whole subject on cleanliness in schools from Std 1 to 10 I think! I couldn’t agree more. What was intended as a celebration of our customs has now been reduced to a game of one-upmanship. Festivals have now become a cacophonous versions of themselves, with total disregard to our sensibilities and environment. Absolutely loved this Post, Richa! Thanks Purba! More spent bucks and more bangs epitomize Indian festivals sadly. I hope you aren’t missing the cacophony in your new land! I was in Mumbai once during the Ganesh festival and I loved the spirit with which it was celebrated. I thought South Indians lack that spirit and our festivals are so dull and colourless! But these days, the importance of rituals is decreasing in our lives and we are actively seeking alternatives. Not sure how much the alternative is going to be better! I think there needs to be a balance between celebrating with gusto and adhering to some rituals. The grass is always going to be greener on the other side otherwise! Zephyr, this is an Email from a good citizen of our city. It is rather long, but , I thought it relevant here. Feel free to discard,. I have few doubts here.. I am not trying to discourage this, but we need to start thinking about it. Do we really know why we celebrate Ganesh Chathurthi in public places with big idols? I remember knowing about Lokamanya Tilak in Maharashtra (Pune if I am not wrong), started these festivals including Holi to be celebrated in public to make every one stay together and make people have communal harmony. But now, it looks like this is totally the other way. Instead of communal harmony, there is fight between religions, every one. In fact there are 3 Ganesh idols just within 50 meters from my home, one right in front, one to the left and one to the right. The people who put these themselves fight with each other, fight with respect to getting largest idols, more sound and music (it becomes noise rather), more hangama and what not. So the purpose of getting the Ganesha idols in public places, the intention of Tilak was totally lost or rather reversed! Next question is within our houses also we see that we need to get as big idol as possible. How big is big and why do we need big? Now if I say we have to get smaller idols, how small is small and why do we have to get Ganesh idols and have them immersed in waters in the first place. Without knowing answers to all these, why do we just blindly follow these? I do understand some groups are making clay idols and environment friendly idols. They are doing real good job, but it is also necessary to make everyone aware of consequences of these resource over utilization. This in fact may also be correlated to clay idols also. Remember if we need more and more idols, we will still need more clay and where do we get that much from? This also might become an issue eventually, who knows! All I want to say is just know and realize what we are doing and then if we think that it is beneficial not only to us, for the people around us and for the environment, then only do it. This is for everything that we do. Not just these idols use POP, but also artificial colors, which will pollute our lakes. The people who put these Ganesh idols, not only put lot of music, loud speakers, noise from all sides. They also use excessive lighting, electricity and waste lot of material, which comes out of trees and plants. If we are growing those many trees to use all these materials, its OK, but without actually planting these trees and plants, if we expect them to be used, we will be doomed. By the way, I also do not know the purpose of putting so many kinds of trees, leaves, fruits in front of Ganesha idols and then making them all dumped (not sure if every one does that also) in to lakes. If we really need to put in these big idols, why not just restrict them to one per colony, and involve all the people from the colony in different kind of activities like dance programs, traditional programs, which will not only inculcate values and make people not to lose our traditions, with proper understanding of course. These are some of my thoughts I just put across. I hope you all agree with the same. I have decided to get a clay idol this time and that too with a size of my palm and will try to get only one or two leaves and of two kinds. I will do the immersion of the idol in a bucket of water and then use the bio waste to be used as manure to plants and trees near my place. I will also try to understand why I need to do this at all in the first place. Hey Pattu, hope you gave the link to this article to your friend to read. All the things he has said are outlined in the article. I have a feeling that just as schoolchildren are getting aware of the menace of crackers, the orgainsers of these festivals will also soon realise the wastefulness involved and the various types of pollution generated by immersion of the idols made with POP and other toxic paints and decorations. For a change many many families have begun making idols out of clay, involving the children in the process and then letting the clay go back to earth again. My DIL and granddaughter have used playdoh to make theirs 🙂 In my house I do puja to the little stone idol worshipped for generations. So…. The reason why leaves are used for puja is because Ganesha is the elephant god and leaves are the food of elephants. But only 21 leaves are used for the puja. I would love to connect with this friend through mail. Could you give him my mail id? I gave the link Zepyr.I will give your mail id too. Thanks for your comment. I quite agree with most of what you have said in my blog. In the coming years with increasing awareness from people like you and your friend, we might be able to curb this menace of synthetic material harming the environment. In Mumbai it is no different where playing item numbers from movies at religious events is concerned. Funny about the Ravanas haath sponsored by x company! With 10 heads too, they ld have plenty of individual sponsors. So much commercialization indeed! Richa, A wonderful post, reflecting thoughts that were always in our minds. 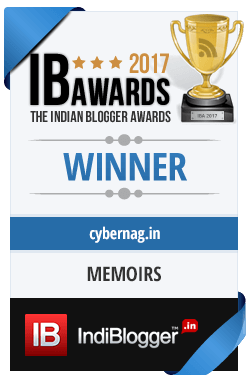 Most of us , who visit this blog, do our bit in small ways to preserve the sanctity and eco consciousness while celebrating festivals. But the larger public, want Tamasha, that has been fed to them since years. This Tamasha is like the soap-operas of the Indian TV channels. People are pulled by the pomp and sound. Whoever, started the community celebrations to unite India, must be turning in their heavenly abode. Now it only adds to the communal disturbances in certain pockets of the country. Another sad occurance is , the pomp and traffic stopping style, which was exclusive to Mumbai and Pune, has spread upto Tamil nadu, where I had not seen this mass celebrations for decades. For the last decade or so, this has been done, to show the might ? Thanks for your comment. I echo your thoughts on celebrations that were once meant to unite are now the cause of communal disturbances. What an irony it is. It is funny how only festivals that are noisy in nature are spreading across India. Similar to the Ganesh festival, Navratri and Dandiya of Gujarat have spread everywhere now. I do wish the good traditions were relayed to all parts instead of only the noise inducing ones. what a beautiful and thoughtful post ! I so agree with you richa . For the past few years I make ganapathi idol with turmeric powder and dissolve it in a bucket of water to be later used for watering my tulsi plant. Nurture nature, that is important.And like you say it is time we tone down the horror in the name of a truly wonderful celebration of nature. Thanks for your lovely comment. I am so happy to hear of so many people who make their own idols, and seek to reduce pollution. Thanks for sharing. I hope there are more people like you! Very interestingly written post. I didn’t know that Tilak started the community celebration of Chaturthi. Until few years ago, Chennai was not this busy during the festival. We thought only Bombay and Bangalore was famous for this festival. But the ‘celebration’ has come here too! Last year one huge Ganesha was kept at Venkatnarayana road which was done with fruits! And I noticed that the area is full of celebrations in the evening but when you cross these idols in day time, they sit alone under the pandal and some hooligans will be sitting and chatting near the statue itself! And the ‘immersion’ stage is worst. The idols go to the Marina beach among police protection. We fear to go to the sensitive (muslim) areas during these times, esp. the Triplicane area. Yes, the equivalent songs of Sheila ki jawani are played and danced, here also. We at home use the clay idol and immerse it in a budket of water, though we have a huge well at home. I don’t want to pollute the well! None of our friends and relatives use painted Ganesha. Only Ganesha should come down to protect himself/us! Enjoyed reading this Richa. Thank you, Zephyr! When festivals get adapted in different parts of the country, it is funny how only the worst of them get transferred rather than the good parts. Now wouldn’t it have been nicer if the custom of using clay idols came to Mumbai from Chennai instead of the rowdy celebrations being passed on there! Sigh!, I hope with all the awareness programs and media attention, people might just change in Mumbai one day for the better. well this year we have a ganesha right on my street ! I already have a panic attack !!! I liked your suggestions . Wish everyone would follow these and spare a thought for the environment . There is no escaping the ‘festivities’. Spread the good word at most in your community! Very apt and timely. Great suggestions on how to celebrate the most affable Lord’s benevolence. Children are very conscientious, unlike some adults. Look how the use of crackers has come down. Perhaps school is the right place to inculcate these ideas. You have given the perfect example of less use of crackers. After all we all learn from school and our families. If we instill in our younger generation of what is right, it might make a huge difference. Very true, coincidence I was talking to someone today on the same topic, I am Sure God Ganesha did not tell us to kill others , or do anything that will harm other LIFE on our planet , but that is exactly what we are doing..
Look at all the pollution which in turn kills so much life in the water the Visarjan is done.. Exactly my point. No tradition or religion asks us to indulge in killing or destroying nature. It is pathetic to see the direction in which religion is misused causing so much damage to the environment. We dont think twice killing when it comes to religion.. How can the leaders or religious leaders talk their way out of this , baffles me ..
how can the most religious people not say a word against this all baffles me more .. Very well and forcefully written piece.It is not Ganesh Chathurthi alone.Every festival done as community puja is ostentatious,loud,lavish with less devotion and more show.These provide occasions for people generally to get out of the dull routine and get some fun..Some of these go overboard.Where there is a religious slant, it is difficult to control by the law enforcement except increase vigil and limit the licenses. All said I loved the Puja celebrations in Kolkata despite the noise,crowd and chanda. Truly said. Even other community festivals are celebrated similarly. Granted that they are an outlet to have fun, it should be within decent limits which should not inconvenience others. Being public nuisance in the form of loudspeakers, affecting traffic, causing pollution should not be condoned for any festival by the authorities. Well Said!! Seriously, in the name of festivities, hooliganism is getting promoted! Those tips are very wise ones. I love the idea of using clay idols made by kids. Maybe some workshops should be run during this time to promote the use of clay idols. Suranga Date has helpfully provided a link which provides a guide to make one’s own idol. Hopefully, such resources are used by people. Nicely written. When you get a double dose of great content and great writing, that’s all one can ask for. Lord Ganesha is the queller of obstacles. I remember my grandpa telling me when I was in kindergarten that everything, big or small, had to start with a “pillayaar suzhi” (Tamil term denoting Ganesha’s swoosh) for it to overcome hurdles and become successful. Ironic that the festival that celebrates Lord Ganesha has itself become a source of obstacles. Agree that we must practice moderation in the way we celebrate. We take great pride in making religion, which is a deeply private affair, a much publicized event in our part of the world. Thanks for your generous comment :). Truly spoken about the irony of the situation. It may have been a good thing once upon a time to make the festival a community festival. But now, over-the-board events, revelry and commercialization have taken away the higher purpose of the celebration. My sympathies with you if you are staying near the beach (although Visarjan time is the only time that I am not envious of a house near the beach :)). But trust me, every area is no better than the other. At a market in another suburb in this season, I almost felt I was in a local train and there wasn’t enough oxygen in the open for the huge crowds! Thanks for sharing your blog. I can understand your being wary of the crowds. I hope the crowds celebrate but are not unruly this festive season. its all so true, I always bring clay idol and small one.. Thanks for your comment Renu. I am happy that the festival is celebrated in the north with gusto too, but I hope the festival there does not emulate the wrongs that go on here! It is up to people like you to educate at least the ones who will listen! The scene is the same in every city in Maharshtra. It becomes a nightmare to travel during such festivals because of traffic jams and the rowdy crowds. Your post is an apt description of the scene these days during almost all festivals. There is a tradition in our house to make Ganpati from the mud in our garden. Since I am not staying in my native town, I have been installing a fibre Ganpati for the past 13 years. We immerse it every year in a bucket of water to signify visarjan and then keep it away for the next year. I feel even if each one of us becomes environment conscious, we can make a huge difference. Your way of celebration is exactly what I want to do for every Ganapati festival. If more and more households were to do away with getting idols and concentrated on the spiritual aspect of the festival, it would change indeed the way this festival is celebrated these days. Kudos to you for being so aware and doing this for the past so many years! Same is the case with Hyderabad too. There is this one big ganapathi at Khairtabad which is really huge. It increases in size every year. I remember how it used to be when we were kids. We and our neighbour kids would tour the neighbouring colonies by foot to see all the diff idols after the festival at home. How much ever we rant about clay or bio-degradable, it won’t make a difference Richa. People will still do what they do. Until unless the government takes steps and makes strict regulations on the number of idols per area and their sizes, it’s going to be the same..And the noise, you bet…god’s ear drums are going to break and he is going to go deaf…Every year, I manage to get an idol with mud or clay..I am just praying and hoping to get one this yr too..good points and let’s hope it makes a difference in somebody’s household. At a time when we are talking about decreasing the size, the sarvajanik or community mandals just want to keep increasing sizes :(. I quite agree with you on steps the government should take to stop this deviousness in the name of devotion. Although it is difficult to ban the immersion, the government should definitely put very stringent regulations on the sizes like you said and also not grant permission to every mandal that approaches them. If the Navratri celebrations could be clamped down, I am sure they can do the same for Ganapati as well. It all boils down to political will unfortunately. Very good post. The louder the better is the mantra nowadays everywhere. I sometimes feel if God could come, he would have switched the loudspeakers off himself. Thanks for your comment. I wish God could indeed turn off the speakers himself and also clear up the traffic jams in a jiffy! Ah, there are so many things He would do if He could! I am glad you recall the celebrations at home rather than the frivolous ones that go on outside! Thanks for your comment! Unfortunately all religious festivals have degenerated into crass commercial ventures and the Government dare not interfere to stem the pollution for fear of loss of vote banks. We celebrate Ganpati at home, get a Plaster of Paris idol as the clay idols are not easily available and immerse it in the artificial well provided by BMC. Festivals world over are exploited by commercial ventures and there is not much that we can do about it but do what we do properly atleast at home. Glad to hear you do the visarjan in the BMC tanks, but perhaps this year or the next you could get an eco friendly idol. With rising awareness more options are available if you hunt for them. Thankfully, I was able to get a clay idol from the nearby shop :). Not that I did not hunt for the options. Am not lucky like you to get at a nearby shop. That is precisely what I had said. Easy access to clay idols needs to be effected before saying nobody is doing it. BMC’s efforts at encouraging immersion in artificial ponds has achieved amazing results because they have provided these in most areas and are doing an excellent job of maintaining them. I am with you there. POP far outnumbers the clay idol supply. Hopefully, the artisans are encouraged to create clay idols and by the increasing demand and are also given some sort of incentive by the government to do so.Only then, will the supply be more. Every single festival that celebrated nature has now become one that destroys it. Any religious festival has, at its core, the idea of the destruction of ‘Ahankara’ – the pride in self – and, now, they have all turned into massive demonstrations of ‘Ahankara’! And we fight any attempt at questioning this by damning such attempts as irreligious!! Truly a well-timed, much needed and well articulated post! Thanks Richa and Zephyr! I quite agree that many of our festivals are more destructive rather than bring about harmony. Gone is a lot of the sanctity, but atleast some of our traditions are still alive. I only hope we turn towards what our culture truly embodies and stop being petty by being ostentatious. When we start equating devotion with who screams the loudest and who creates the highest idol, it is time for some thinking. We all know that Gods really do not care about how attractive their idol is but what makes us blind to this fact? In Delhi, we do not have anything on such a large scale but the Kanwariya do create a lot of noise every year. Although I must state that it has been getting more and more organised and less painful since the past few years. Exactly my point Amit. It is almost a good thing that the festival of the Elephant headed-Lord has not yet invaded Delhi the way it has in Mumbai. I am glad that the existing festivals are growing more peaceful. If only, the same happened in Mumbai! It is interesting to hear about the Ganapati festival in Maagh instead of Bhadrapad that it is celebrated today. I guess, Tilak started a completely new tradition when he started the celebrations much later. You are right about the change that is very gradual but which is happening in some ways. While the majority continue to consider the gloss as tradition, there is a growing horde of people who are more aware than they were a few years back. I can agree to this. The Lalbaug friend I mentioned in my previous comment – his wife’s family is based out of Siddhatek, and they celebrate it at the Ashtavinayak temple in January only. I guess they will be one of the rare families that celebrate both festivals – a private, simple ceremony during Jan-Feb, and the boisterous, public party in Aug-Sep.
To think I wasn’t even aware till now about this same festival in Jan! It is great that traditions are still kept alive in some families at least. Nothing showcases the decadence of a good old festival than greeting Lord Ganesha with Sheila ki jawani; one thought he had better stuff available up there. And the Good Old Lord again behind gargantuan traffic and ecological nightmares, not to speak of blizzards of eve-teasing? Is the Big Lord then a perpetrator of all that? Sacrilege! Sedition! Damnation! Perdition! Those are truly sensible ideas Richa has proposed here. It should do a lot of good to the humans here and the Lord above. The Shiela and Munni songs are bad enough,but even worse is the trend of interspersing some devotional words in these songs itself or using the tunes of these songs for some bhajans! Enough to rankle anyone in his senses and understand the deterioration of what is a holy festival! The Lord is certainly not a perpetrator but a victim of all the wicked that is done in his name! While true devotees had started worshiping him to bring peace, the others, merely used the means to enjoy and indulge in base pleasures! The Lalbaug area have many iconic mandals, each in its own way. A very close friend lives there, and he indoctrinated us into the fervour of the festival during our college days. We never had to go through influential channels to visit the mandals, we just walked in. The maddening crowds have come up only in the last few years, post the media coverage they started getting. Not that these celebrations have had negative impacts only. Sometimes, they do become beneficial. Lalbaugcha Raja, for example, holds an auction of the gifts received during the festival. The funds collected go to running a free clinic near the Lalbaug market. An old flyover, in need of repairs, was broken and a new, higher, one built because the Raja’s immersion procession had to pass below it, and the bridge was too low. It has been termed wasteful expenditure of public money, but somehow I think that it was a good thing. I can’t imagine walking in to the Lalbaugcha Raja mandal. I have heard tales of people camping out in the rain all night there which has dissuaded me to go. I had heard about the charity done by LalBaugcha Raja trust. 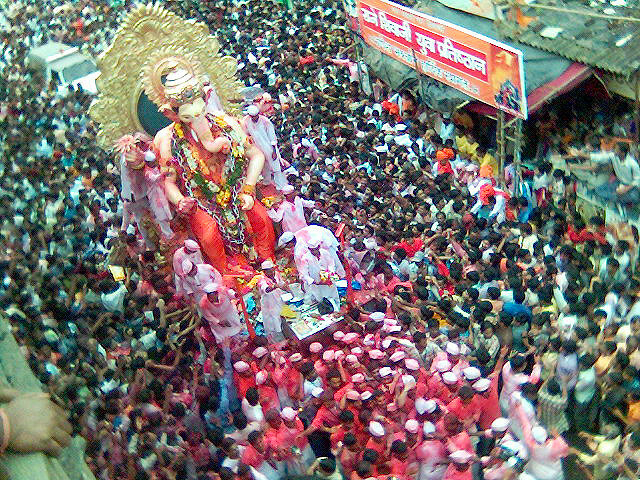 Lalbaugcha Raja has a huge inflow of money – 5-6 crores in 2011 I read in the Mid-day. Unfortunately, I cannot say how much accountability there really is in handling the money for these mandals. i am sure many of these are just for the collections part of it too! Last year, they had notices put up on the path for the ‘navas’ devotees: “From this point you are 48 hours from Darshan” “24 hours to go for Darshan”… you get the picture. Welcome to a media-savvy world, where a vicious circle puts the Lord on a pedestal, and that invites all the more devotees to come out of their homes, and that brings in media attention… and so on. Plus the paid lines, VIP lines, VVIP lines, common lines etc. Even to see God there is a price! Ofcourse, there has to be media attention. Why else would the sponsors spend so much money on the mandals if it was not to gain attention and publicity! Thats what this festival has unfortunately become all about. I would rather go to the temple nearby and pray for the same peace. Ganesh is the favorite bhagwan of my younger son. In my growing up years, I enjoyed the festivity surrounding Ganesh mandals in Mumbai. But, the larger scale of the festival has got me fuming. Also, these idols cause so much of water pollution. But, dare you utter a word of reason, and you are branded anti religion. I’ve been trying in vain since the past few years in my community in Bangalore to get to have a clay idol. But pomp and show always wins. Most seniors are just not willing to listen along with some traditional ladies. I am saddened that devotion has been side tracked and all our favorite festivals have been hijacked by snob value. Good post Richa! I can totally sense what you feel. More than the uneducated, it is hard to explain reason to the educated people. These very ‘traditional’ and ‘religious’ people don’t understand that they are being irreligious by causing the havoc to the nature that they do. Maybe, you should try and get some like minded people like you to try and out talk the people who organize these events in your community. The festival is about being in harmony with nature, not to destroy it! Hopefully, with all the awareness campaigns, they might just realize what you say is right and that their ‘tradition’ is headed in the wrong direction! Good idea, Richa.They have promised me that next year, it will be a clay idol. I will wait and watch. The problem is that very few people are as outspoken as yours truly. Largely when we live together, people want to keep their mouths shut. With such a huge water scarcity in Bangalore, this is criminal pollution of precious little that we have. Thanks for letting me rant in this space! I can’t think of a better way than celebrating this festival than truly being in harmony with nature using lovingly hand-made clay idols. I am glad that amidst all the gloss of ‘my Ganapati is bigger than yours’, there are families like yours which keep the good (and correct) traditions alive instead of emulating some of the harmful new trends (read Plaster of paris idol visarjan) followed by everyone else! Bingo! This is one of my much loved festivals too but over the years we have somewhere lost the spiritual quotient and the very essence of the festival and how — In the name of rituals and traditions itself! Its been reduced to a ‘thing of status’ as you rightly pointed out, with the thinking that a bigger Ganpati and a blaring loudspeaker ‘shows’ how much more is a person’s societal influence. So many people see this festival today as a reason to ‘party’ which is just plain sad. Lord Ganesha is also known as the Lord of Wisdom and learnings, and I really hope He blesses His devotees with all the wisdom that you have tried to highlight through this wonderful post. Thanks for this guest post, Zephyr aunty! I cant imagine anyone else tackling this issue, so pin pointedly and in a straight forwardly manner, any better than Richa! Thanks for the comment Arti . There are so many pathetic things done in the name of religion that now it has become simply disgusting. Be it Ganapati or Holi, or Diwali, people seem to only want to adhere to the ‘fun’ part of it. As you said, one can only hope that the Lord Ganesha instills some sense into the misguided sense of celebration that seems to be so rampant these days. That was a timely reminder to all of us to retain the essence and do away with the gloss. Well said! It is sad to see devotion taking a back seat during such celebrations, with so many distractions. I know of people who go around looking at all the Ganapatis in their city, though it is getting tougher by the day with traffic snarls and other problems like hooliganism. In my house we do the puja to the little stone idol, which has been in the family for generations. Even if we buy a Ganapati, we don’t do visarjan but keep it in the navartri kolu, (jhanki). In my mother’s house it is still hand made clay idols. My brother still makes them every year. ← The Blog Bully — Are you a victim?